This little oil painting was part of a three piece commission. My client brought me her favorite pairs of "shoes" to paint with a "bird" on each of them. 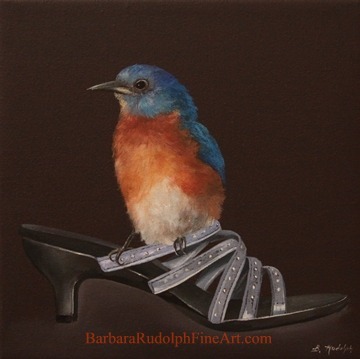 I painted a "bluebird" on the blue sandal first. The canvas size on each one is 8 x 8". The second one was a tweed black and white shoe with bright red trim. 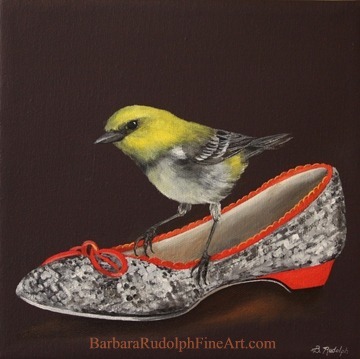 I painted a little warbler onto that "shoe". The 3rd one was actually painted during my previous year's art show. 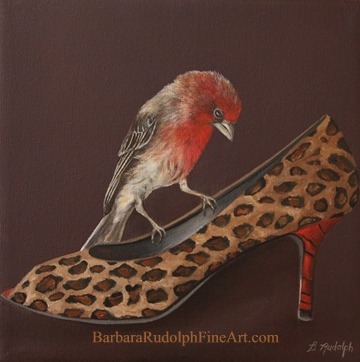 It was a fun little animal print shoe that I posted a while back called "Curious Couture." It's always nice to get commissions finished up and shipped out. I hope she will enjoy them in her new home. I am lovin this series. The shoes are the cutest and your birds wonderful as always.